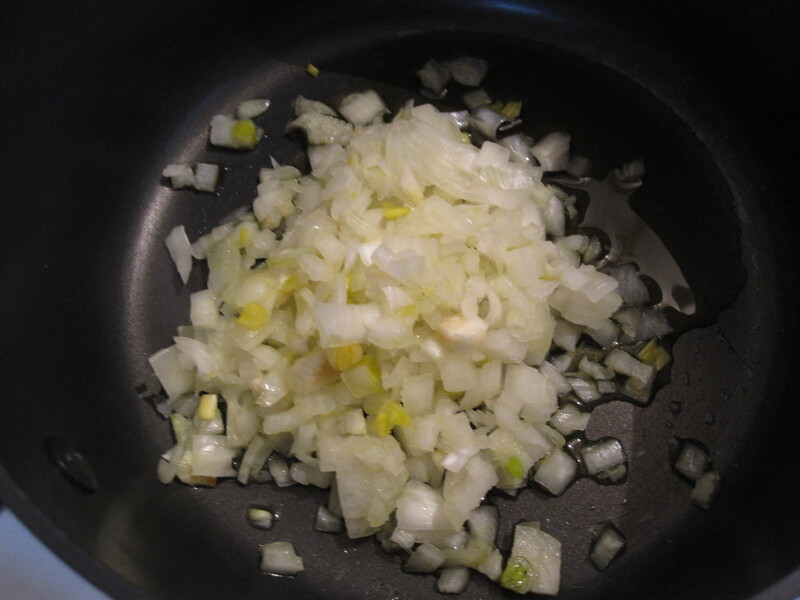 Like so many of the recipes we make here, we begin with onion. 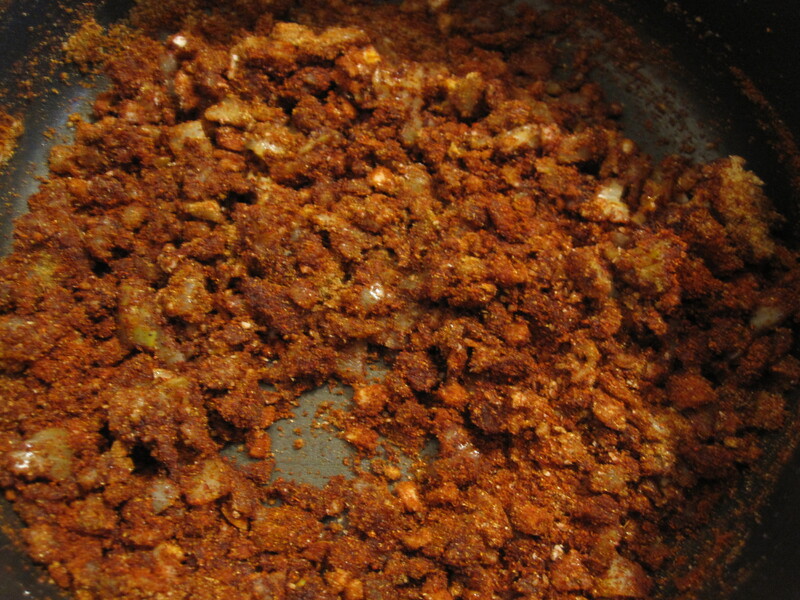 This is the base for the enchilada sauce along with several different spices and of course, tomato sauce. It simmers for 8 minutes and it’s done. Not too bad. I baked the chicken and once it was cooked I shredded it. 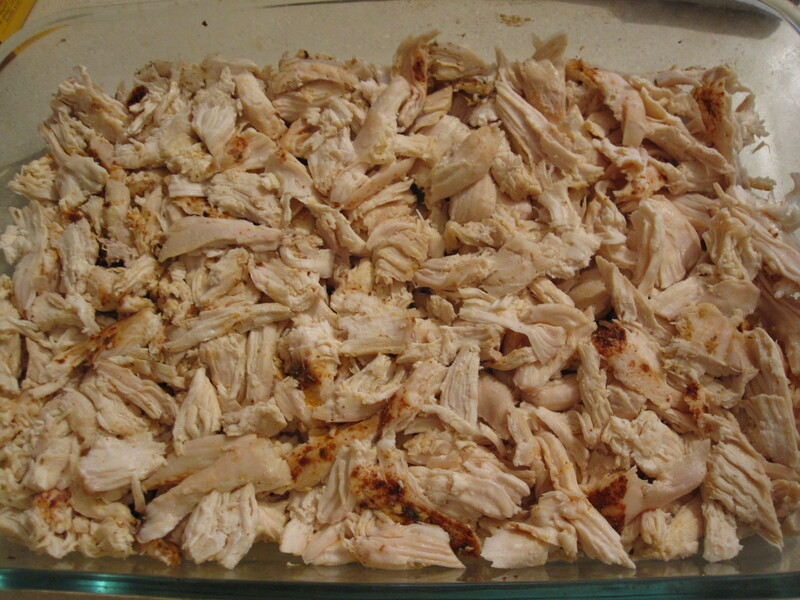 The chicken forms the base layer of the bake. 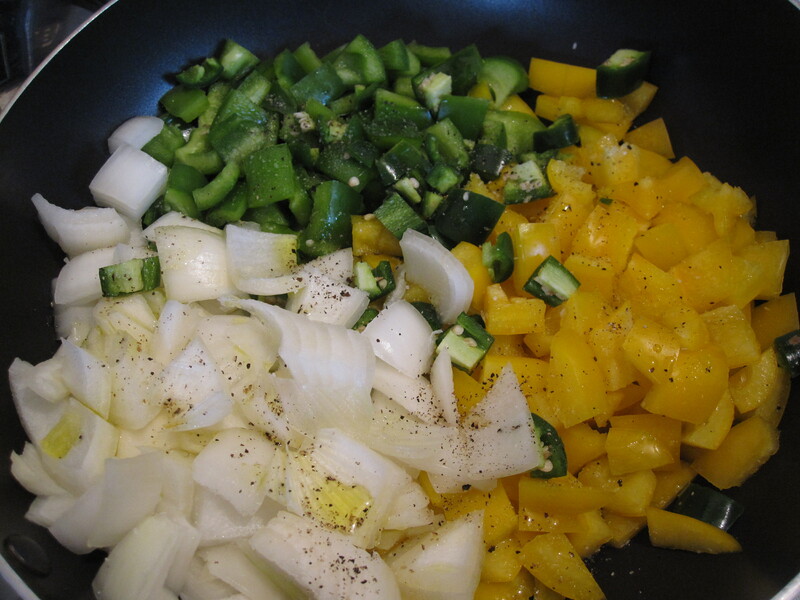 Next, saute some peppers and onions, until they are starting to get soft. They will continue cooking in the oven so cook them to about 60% soft. 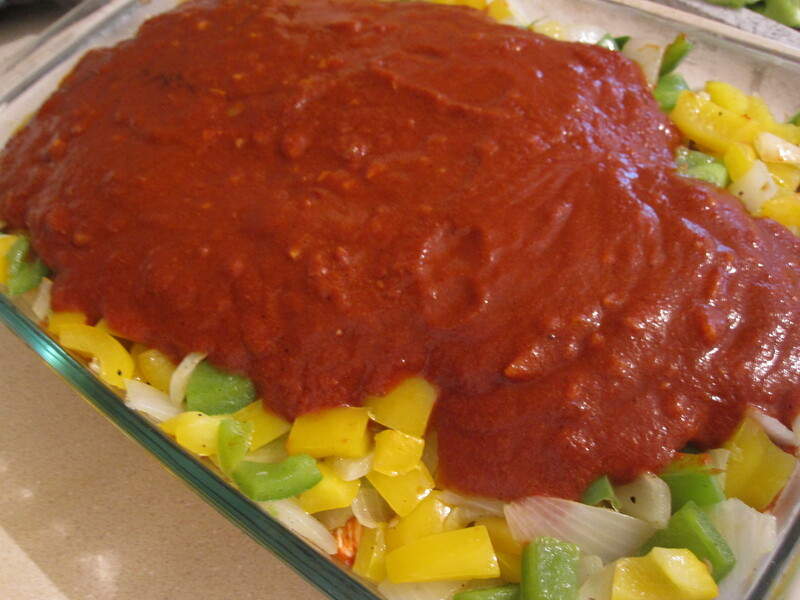 Once they are cooked, spread them over the chicken and top with the enchilada sauce. 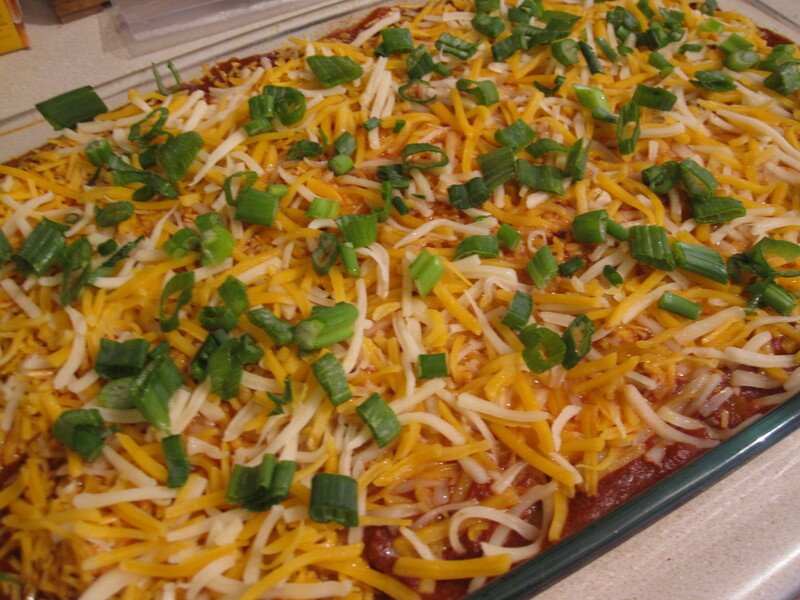 Cover with shredded cheddar cheese and some sliced green onion. Bake it until it’s all nice and bubbly, melty and gooey (all technical terms). and that’s about it. Pretty simple and yet so satisfying! The home made enchilada sauce was nice and robust. The chicken can dry out a little so you may opt to use dark meat. I used boneless, skinless chicken breasts so I was not surprised by the texture, but this can be adjusted for. 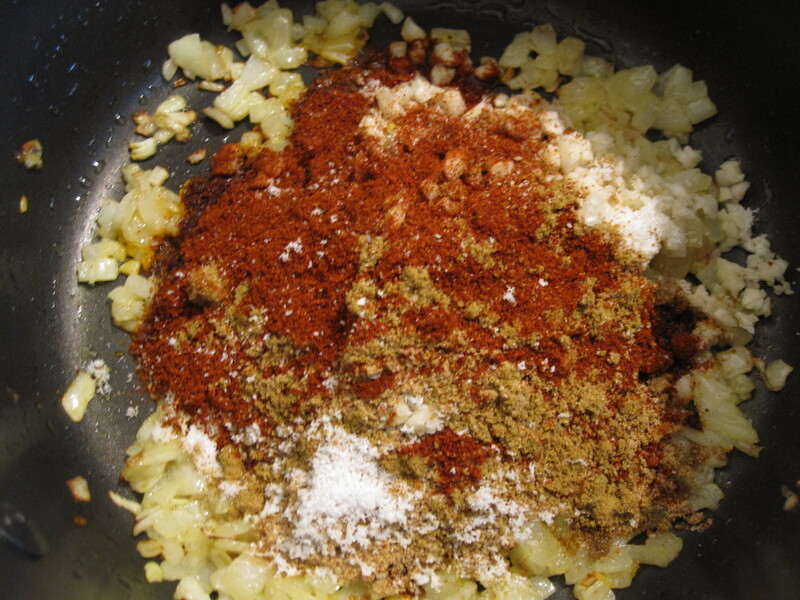 You can add whatever you want to this in place or in addition to the pepper and onions. It was also great as leftovers. 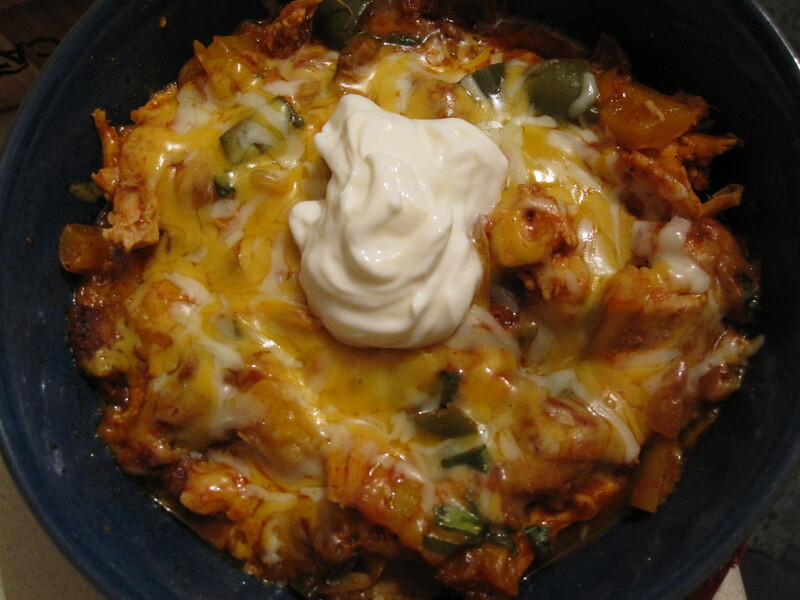 We topped ours with sour cream. Sliced avocado would also be awesome I’m sure. Overall, it was a nice tasty weeknight meal. 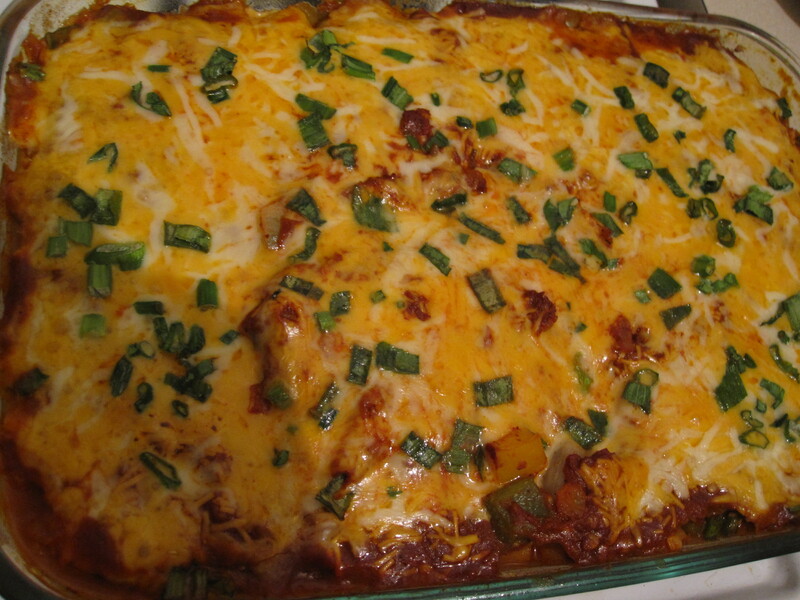 This entry was posted in Chicken and tagged bake, cheddar cheese, chicken enchilada casserole, enchilada sauce, Green onion, homemade, low carb, no tortillas, recipe. Bookmark the permalink. I didn’t have any peppers on hand, so I put a layer of black beans where the peppers would go. Yum! Thanks for this recipe! Where do you see Splenda in this recipe??? What is the yellow stuff with the onions and peppers? What time and temp for baking? Totally pinning this, but would love to know the specifics of your sauce recipe so I can make my own. Thanx. What spices are you using and how much? This looks great! How is this an E with the cheese? How big is this pan? Or did I miss that part?? Saw this this morning. Tried it tonight. Perfect without tortillas because I’m doing wheatfree. I had no tomato sauce so I put canned diced tomatoes and bit of tomato paste in Nutribullet, and that worked great. 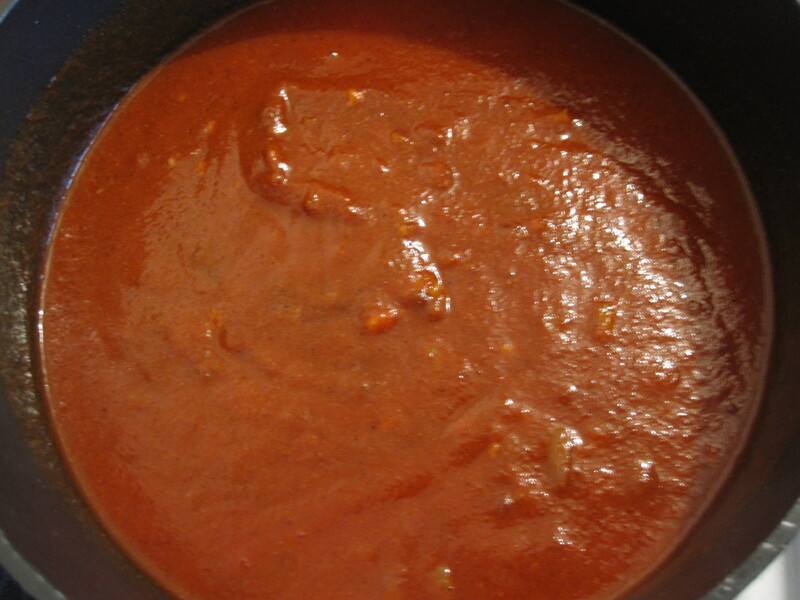 I didn’t understand instructions for enchilada sauce, so found another recipe. To avoid the flour, I ground up refrigerated brown rice and that worked well in enchilada sauce. Finally – it was delicious! I don’t think it can be messed up with whatever minor modifications are made. Not a cook at all so this question may seem dumb……….To make this a freezer meal where do i stop in the recipe process? Do i cook it all the way and then freeze or go right up until the bake process and then freeze it? Thanks! No need to bake it if you are going to freeze it. Stop at that step. Then thaw and bake when you’re ready to have it. Do you know carb / sugar count ? where can I find the nutritional values? if you soak your chicken in buttermilk overnight before you cook it you will never have dry chicken again. 😀 Just throw it in a ziplock bag, cover with buttermilk and park it in the fridge ( can even be frozen ) when you are ready to cook, drain off the milk and proceed with the recipe. Don’t even have to rinse it cause you will never taste the milk. Sometimes I even add my spices and marinate it like that. Best chicken ever! We made this tonight and thought the flavors were delicious. Our casserole was “soupy” Any ideas why? Or what we could change to get a more firm consistency. Thank you. P.S. We used 16 oz bought enchilada sauce. So I want to make this tonight what seasoning did u use for the sauce? What season h did u use for the chicken and how long dI’d u cook the chicken? At the bottom of the page you’ll see a link to the recipe! What are the seasonings in with the onions?? At the beginning?? About how much chicken does this recipe call for? I read, but can’t seem to find the specifics. How many carbs is it? I made this following the recipe the first time and loved it. To change it for my vegetarian daughter I used 2 cans of drained black beans instead of the chicken and it was great!! 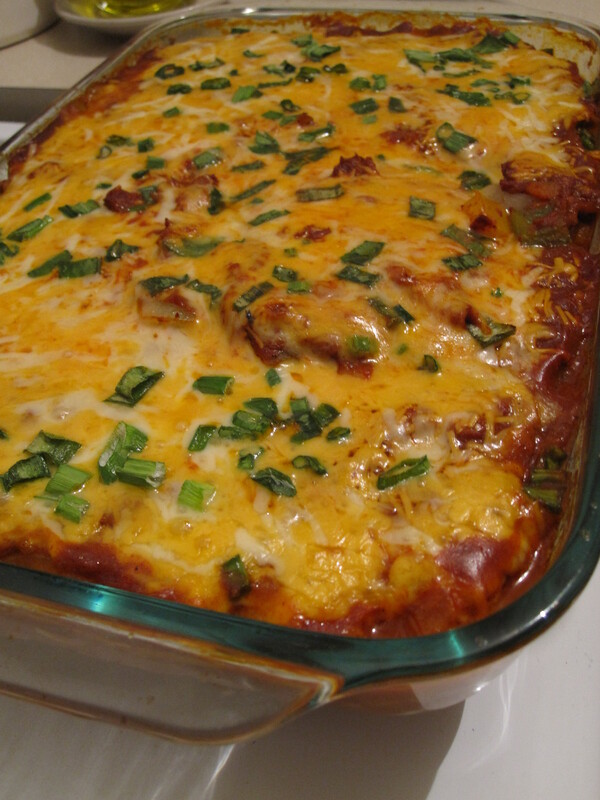 I did put a layer of cheese over the beans as well thanks for this great recipe!! The link to the recipe is at the bottom of the post. Definitely worth a look! Thank you so much for this delicious recipe! 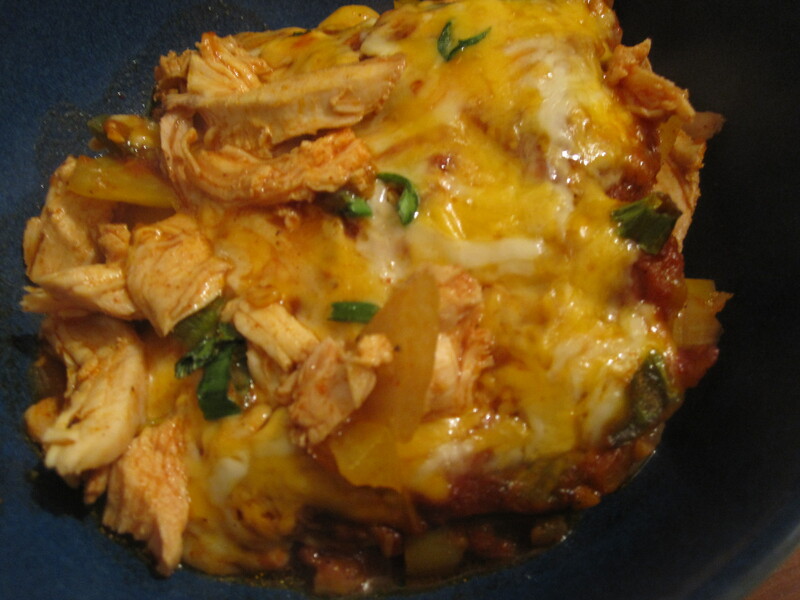 My husband and I loved it, we didn’t even miss the tortilla shells. It is one of our new favorites!